Brand new vacuum-advance SVDA 034 Distributor for Volkswagen Beetle, Ghia, Thing, Bus, Type I, II, III, IV, Porsche. Includes 3BOS4U1 electronic ignition conversion kit already installed, ready to run in your air-cooled VW or Porsche – Just install distributor, connect the red wire to the coil's positive (+ or 15) terminal and the black wire to the coil's negative terminal (– or 1), connect vacuum hose to carburetor/throttle body and set the timing - Simple! Zero-maintenance 3BOS4U1 electronic ignition means you won't have to fool with points and timing again – always stays in perfect tune! Our SVDA distributor is a quality reproduction of the original, vacuum-advance Bosch 0 231 170 034 / VW 043-905-205, federal model distributor that came stock from the factory on the 1974 VW Beetle with 1600 engine and manual transmission. Perfect for use with the 34PICT carburetor. This distributor requires a vacuum source from the carburetor or throttle body (when used with fuel injection). Can use stock Bosch distributor cap, rotor, etc. Includes OEM distributor shaft D-Ring. Includes OEM distributor shaft D-Ring. 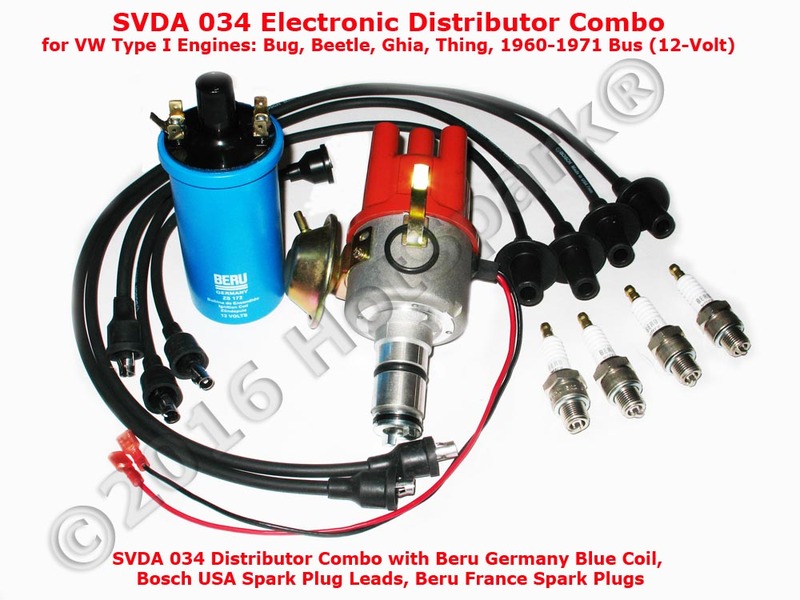 The Hot Spark SVDA distributor is ideal for use with most 12-volt, stock, air-cooled Volkswagens, except later models with factory electronic ignition and those with certain early Bosch fuel injection systems triggered by special contacts in the bottom of the distributor (Bosch D-Jetronic). We thoroughly examine each distributor; everything is adjusted and lubricated before shipping. We then set and test each distributor's advance curve for maximum acceleration and fuel economy, using a precision distributor testing machine. Use a stroboscopic timing light. Timing should be set initially at 30-32° BTDC at 3,500+ RPM, vacuum hose disconnected and plugged. Maximum advance, at 3,500+ RPM, vacuum hose connected, with no load on engine (car sitting still), light throttle, should not exceed 42-44° BTDC. For proper operation of the distributor's vacuum advance, the vacuum source needs to be able to generate a minimum of about 8 inches (200 mm) of Hg. If your engine is running a high-lift, long duration cam, with cam overlap or an aftermarket carburetor setup without an available vacuum source, the vacuum-advance mechanism may not advance fully. However, the distributor's centrifugal-advance mechanism will provide the same advance curve as a properly adjusted 009 centrifugal-advance distributor, simply by capping off the vacuum port. If your car has Kadron or ICT carbs, connect the vacuum hose to at least one carburetor. If your car has dual IDF or DRLA carbs, run a vacuum hose to both carburetors, T them together and then run the vacuum hose to the SVDA 034's vacuum port. If your 1971 VW Bus or 1971-74 VW Beetle/Ghia/Thing has the original dual-vacuum distributor and you replace it with the SVDA 034, you'll need to plug (cap off) the carburetor's retard vacuum port, which is the port located closest to you as you're looking at the carburetor from the rear of the car. Use the advance vacuum port, located on the left side of the 34PICT carburetor. Coil: Coil must have 3.0 Ohms or more primary resistance. The Beru Germany Blue Coil is ideal for 4- and 6-cylinder ignition kits. To measure primary resistance: Label and remove all wires to coil ( + or - ). Using a common digital multimeter in the 200 Ω mode, cross the red and black leads of the Ohmmeter. Allow 10 seconds or so for the reading to settle and write down the reading. Still in the 200 Ohm mode, measure between coil’s + and - terminals. Allow a few seconds for the reading to settle, until it stabilizes. Subtract the previous reading, taken with the leads crossed, to compensate for Ohmmeter's inherent resistance. Do not use a low-resistance coil, such as the MSD or Accel coil; they don’t have enough primary resistance for this application. Test the charging system's maximum voltage: If the charging system voltage, measured at the coil's + terminal, is more than 13.75 volts at any RPM level, the voltage regulator likely needs replacing or a 1.4 Ohm ballast resistor should be wired between the coil's + terminal and the red HotSpark ignition wire. Too much voltage can damage the ignition module and other electronic components. This is to express my thanks for the excellent service you recently provided me. The Hot Spark distributor has behaved faultlessly during our 17,000 miles trip through South and Central America. Click here to see SVDA 034 installation instructions. Replacement distributor for air-cooled VW & Porsche 4-cylinder engines. Replaces stock distributor or 009/050 distributors. Requires vacuum source from carburetor or throttle body. With 3BOS4U1 electronic ignition installed, instead of points/condenser. Everything you need included - no external ignition box required. 30-32° BTDC @ 3,500+ RPM, vacuum hose disconnected and plugged. Use stroboscopic timing light. Timing should not exceed 42-44° BTDC @ 3,500+ RPM (full advance) with vacuum hose connected, no load on engine. 1946-1983 4-cylinder, air-cooled VW and Porsche with available vacuum source on carburetor or throttle body. Stock Bosch 3+ Ohm coil OK. Coil must have 3.0 Ohms or more internal primary resistance. Beru Blue Coil recommended. For air-cooled VW & Porsche only. We inspect each distributor thoroughly; everything is checked, adjusted, lubricated, etc. We set and test the advance curve of each distributor on a precision distributor testing machine for optimal performance with 4-cylinder, air-cooled VW/Porsche engines. Ready to install. Includes cap, rotor, OEM distributor shaft O-Ring and everything you need - no external ignition box required. Charging system voltage, measured at the coil’s + terminal, must never exceed 13.7 volts, at any RPM level. 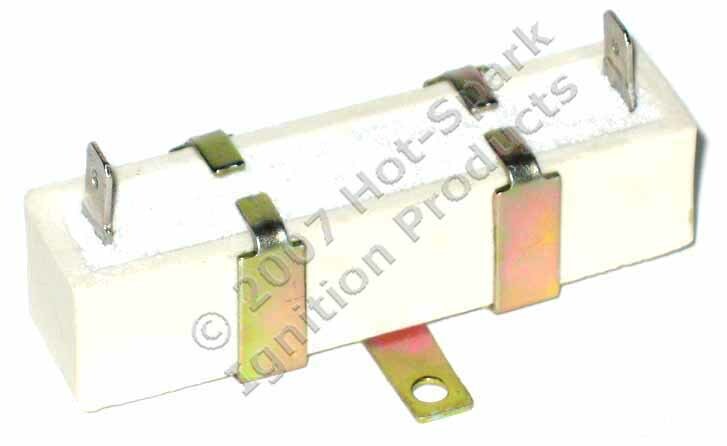 You can reduce over-amperage surges/voltage spikes to the ignition module by wiring a 1.4 Ohm ballast resistor between the coil's + terminal and the red HotSpark ignition module's red wire. 1946-1975 4-cylinder, air-cooled VW Type I engines with available vacuum source on carburetor. Beru Germany Blue Coil with 3.3 Ohms primary resistance included. For air-cooled VW Type I engines only. Ready to install. 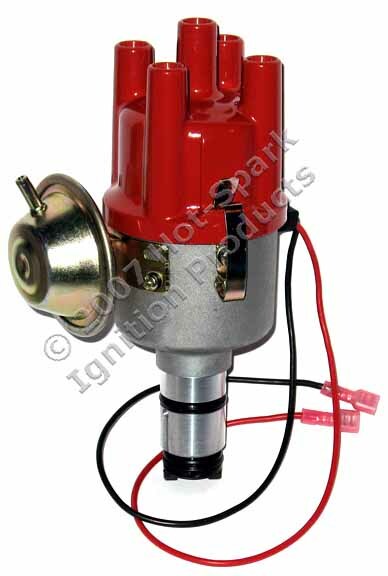 Includes cap, rotor, OEM distributor shaft D-Ring and everything you need - no external ignition box required. Click here to view SVDA 034 Installation Instructions. Just want to thank you for your distributor for my bug. Wow, I thought it ran great before! Easy instructions, amazing!!!! Great job, guys. I will be recommending this to all my friends. I just wanted to let you know how pleased I am with my purchase of the SVDA 034 distributor for air-cooled VW. I have a '69 VW convertible bug with a stock 1600 dual port engine and it had the 009 centrifugal-advance distributor with a stock 34PICT carburetor. I have had the usual "stumble" and crappy slow speed throttle response. I installed the new SVDA 034 distributor with electronic ignition this morning. All went like clockwork and had much to do with your excellent directions. After setting up the timing I went out for a drive and was blown away by how well the engine ran. No more stumble. The transition from slow speed to highway "without" a full throttle attack was amazing! Thanks for such a great product!